March 2018 in Everything Random! 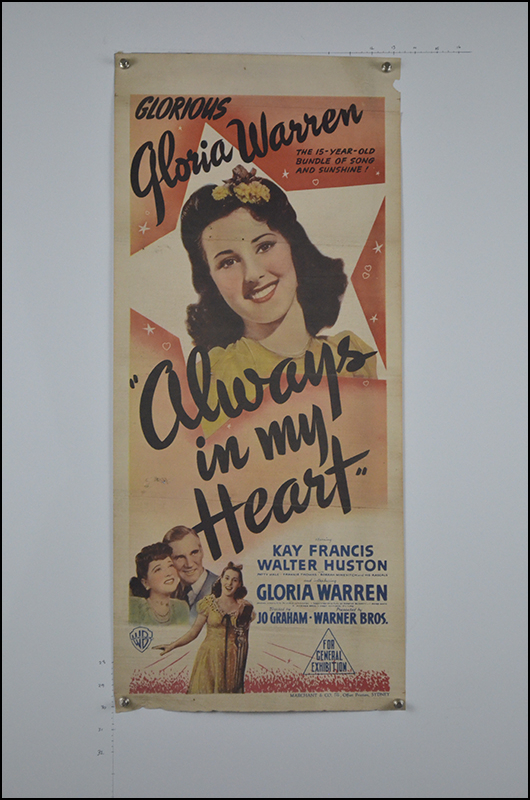 Always In My Heart ( 1942 ). A couple of images borrowed from two forum members. The Australian daybill on the left has the For General Exhibition censorship rating printed on the poster, and the one on the right has the rating stamped on the poster. 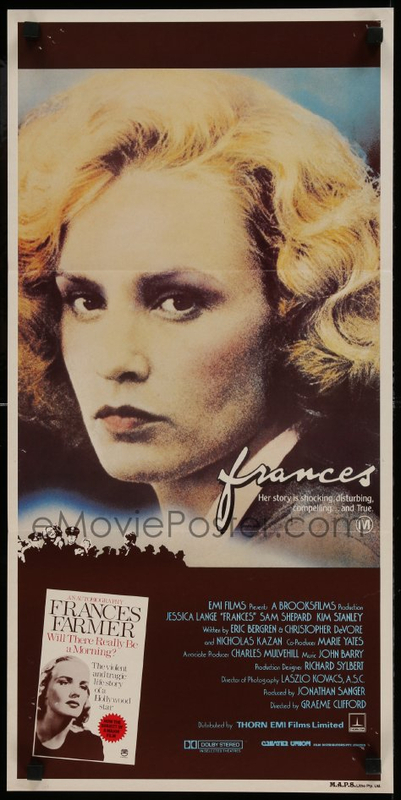 Frances ( 1982 ). A curious one. 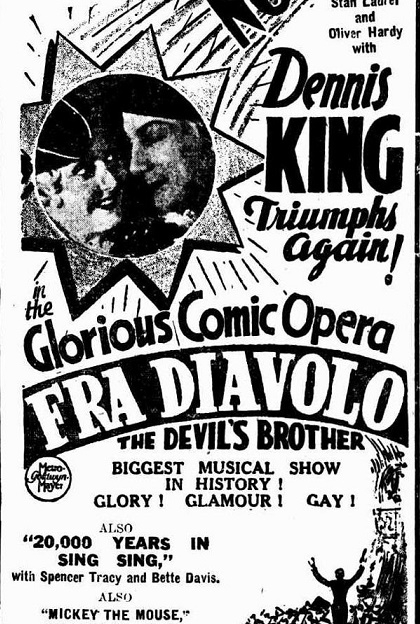 The Australian one sheet and the Australian daybill with a mystery black bar appearing at the top of the poster. One wonders why after looking at overseas material it appears there wasn't anything to cover up in this area. All other copies of the daybill that I have located have the same black bar on them. 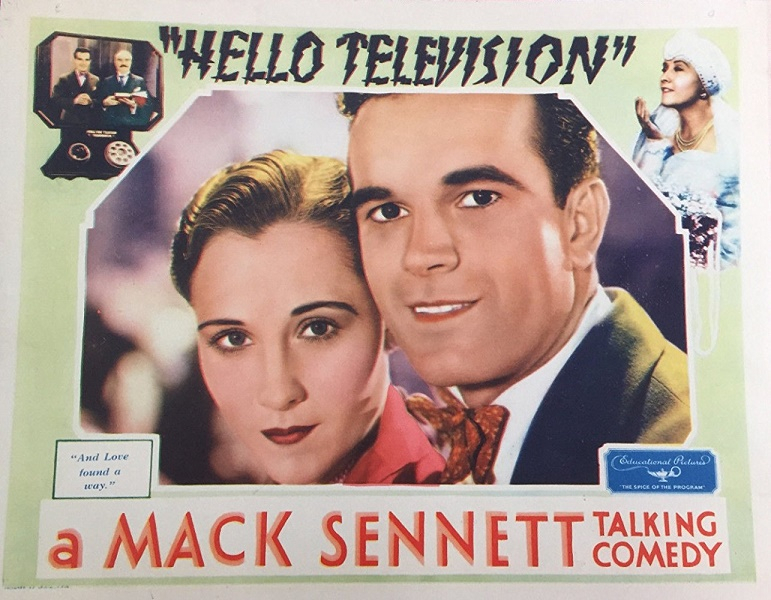 Hello Television ( 1930 ) is a 20 minute Mack Sennett comedy short. Above is a very rare piece of U.S. film paper showing an image of a television set featured in a film only two years after television sets became became commercially available for sale in the U.S.A. The Shiralee ( 1957 ). Released in Australia in 1957 there were two different daybills produced for The Shiralee. 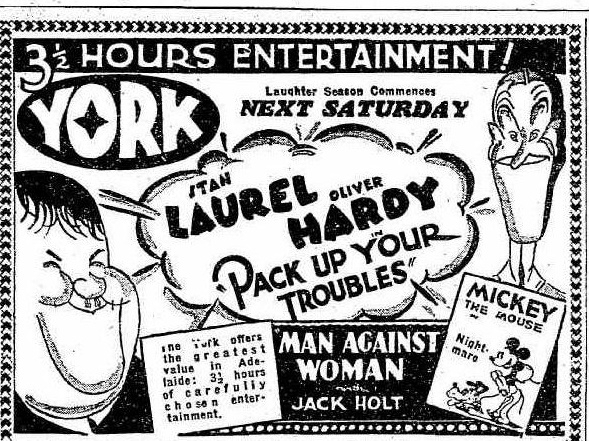 The daybill above on the left was printed by Chromo Print and the one on the right by Offset Printing Co. Chromo Print in 1957 had taken over from W.E. Smith as MGM Australia's preferred daybill supplier. Offset was also printing daybills, mainly United Artists product, in the late 1950's. I don't know for certain but I would think the Chromo Print version version was printed for the Australian release in 1957 and the Offset version was a second printing. 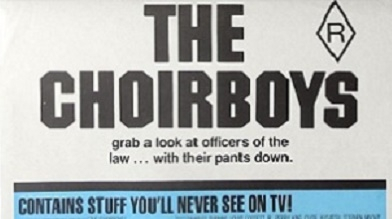 The Choirboys ( 1977 ) daybill. ''The Contains Stuff You'll Never See On TV!'' tagline I haven't noticed on any Australian posters previously. One should never say never. 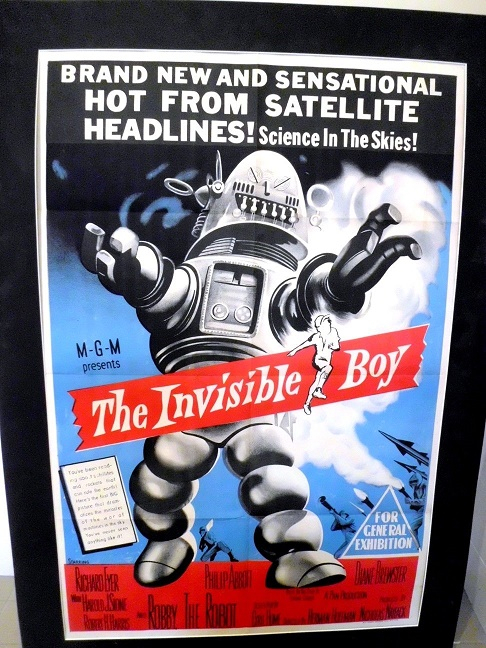 The Invisible Boy ( 1957 ) Australian one sheet. 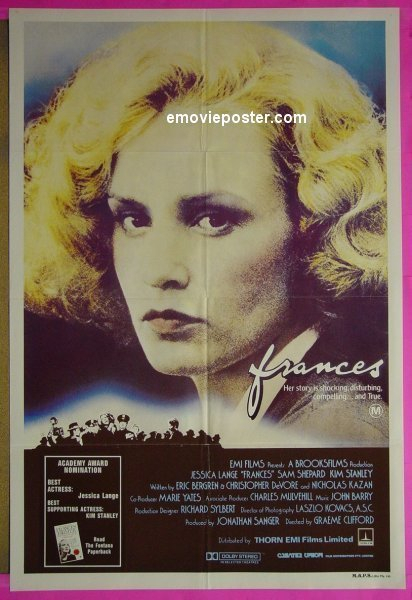 Currently appearing on eBay Australia how rare is this poster? really interesting info, thanks Lawrence. Hope you didn't give too much publicity to Invisible Boy...made me pay a bit for it! I've never seen one and based on the photo it looks great, a lot nicer than the daybill. I'll check my Francis daybill re top border but i think it's there. I have an Invisible Boy Aust one sheet and it certainly is a great looking poster. Printer is W.F.Schey, incidentally. 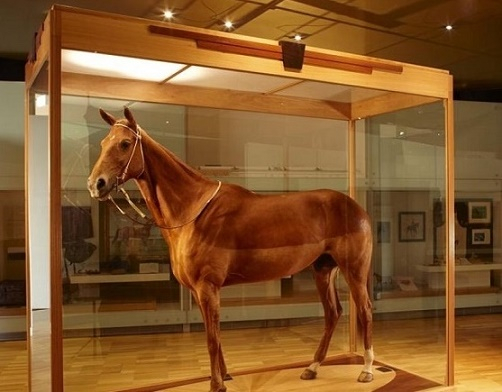 Australia's legendary racehorse Phar Lap, who had a film made about him in 1983, had appeared in archive footage in a 1948 film titled The Winner's Circle. IMDB says ''This film features footage of a veritable '' Who's Who'' of championship horsedom of the period'', which included Man O' War and Seabiscuit. 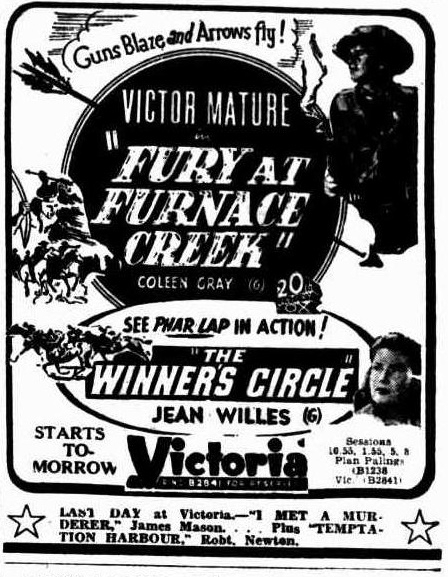 It would be interesting to sight an Australian daybill or any other Australian posters to see if, as in the above newspaper advertisement, he received a credit or not. Shalako ( 1968 ). Just a follow up with information for collectors of Australian daybills and the New Zealand versions of Australian daybills that any new members, or older members may not be aware of. Australian dayills, from the 1930's to present day, should have an Australian censorship rating rating appearing on them and the N.Z. printed version was left blank. As far as I can see the N.Z. distributor's information was never added to the poster. In cases of the Australian distributor not being the same one in New Zealand, the Australian distributor's details, such as appearing above in the Shalako image were also not printed for N.Z.usage. 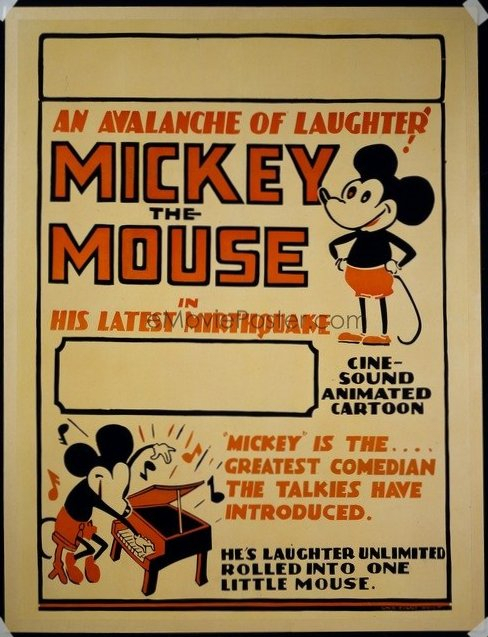 In the early 1930's in Australia, Mickey Mouse cartoons were advertised as being Mickey The Mouse. I'll Cry Tomorrow ( 1955 ). Australian daybills can be confusing sometimes. The one on the left printed by W.E.Smith is from the first Australian release and the other one on the right was printed by Advertising & Commercial for a re-release early in the 1960's. Zero Hour! ( 1957 ). I have waited a long time to see an image of the Zero Hour! Richardson Studio daybill, but now Bruce has just auctioned one The majority of Richardson Studio's 195O's posters we now have images for, but surprisingly this one has eluded us until now. IMDB trivia states about Zero Hour! '' This film is parodied in Airplane! ( 1980), so much so, that the producers of that comedy bought the rights to this movie and used some of the dialogue word for word''. Airplane! was released in Australia and some other countries as Flying High, which I am sure most people know. The Girl Hunters ( 1963 ). From the U.S.A. insert poster the image of Shirley Eaton's head doesn't look quiet right to me. The U.S. one sheet showing Shirley Eaton looks fine though. Duffy ( 1968 ). Two daybills printed for New Zealand distribution showing that N.Z. censorship stamp placement wasn't uniform. 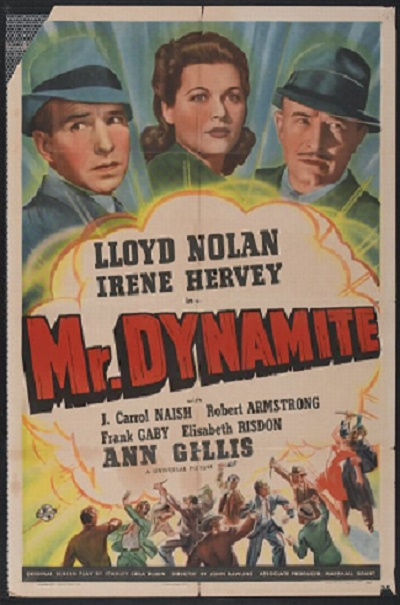 Mr. Dynamite ( 1941 ). 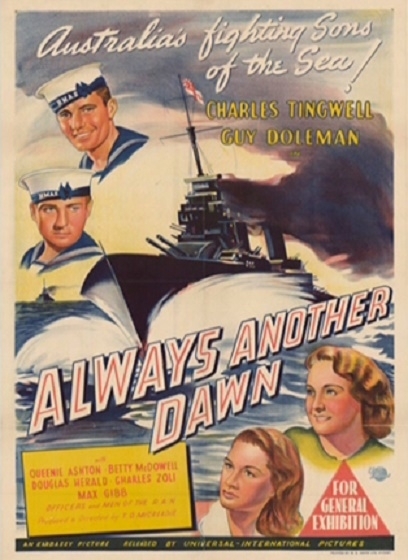 The above daybill appears to have been a stock poster, with images from another film or films attached to this poster. Coast To Coast ( 1980 ). Many CIC then later UIP released films in Australia in the 1970s and the 1980s, mainly for Paramount and Universal, had multiple poster printings for the same film. Often the printings were done by the same printer but a lot were produced by a different printer. I guess we will never know the answer for this practice, but I am going to at this time to concentrate on one title only. Coast To Coast didn't have any big name stars and wasn't a big box office hit, so I am wondering why M.A.P.S. were requested to produce two different printings for this film? The film wasn't re-released in Australia, so both printings were for the original Australian release. There was an Australian three sheet of Rodan! listed in the Hayden Orpheum Picture Palace Movie Poster Auction of 500 items, that was held in Sydney March 26, 1995. The following rare one sheets were listed in the same auction catalogue as well - some have been sighted once before, but a good number of them haven't surfaced at all. This now lets us know that at least one copy of some important titles exist in Australian one sheet form. It would be interesting to know what the posters sold for in 1995. I guess we know where some of the posters that ended up at Heritage originally came from...although I don't think an image of the King Kong has surfaced since? I know of three people who picked up the majority of the posters from the Hayden Orpheum Picture Palace Movie Poster Auction. Unfortunately, I was not one of them although one of the collectors ended up selling most of his collection to me. The Regal here in WA had an auction in 1976 with many great titles up for grabs. I just met a fellow yesterday who was there. He had a framed Bus Stop and beautiful one sheet for Bells of St Mary's with completely different art to the daybill. A lot of Aust posters are in private hands and have been framed. Rear Window 1sht I have also came from the Regal auction. The fellow also had a framed db for The Frightened City '62 that I've never seen before. Similar art to Brit Quad with handgun featured. Would fit nicely into Chris's home decor! Stored only in my mind!! 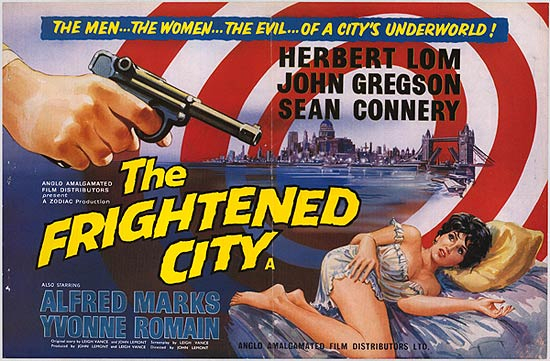 The Frightened City ( 1961 U.K. ). As Mark mentioned the Australian daybill is similar to the British quad. The Australian daybill image is rare and I could't find it on Google today. I then checked my images and found the above daybill image, and although it is from Bruce it isn't listed on his website. I am thinking I sourced if from a bulk lot in the past that Bruce sold, judging from the eMovieposter. Com branding. Maybe Bruce will confirm if this is correct? Fantastic paper, Ves! Those are dynomite Aussie One Sheets! 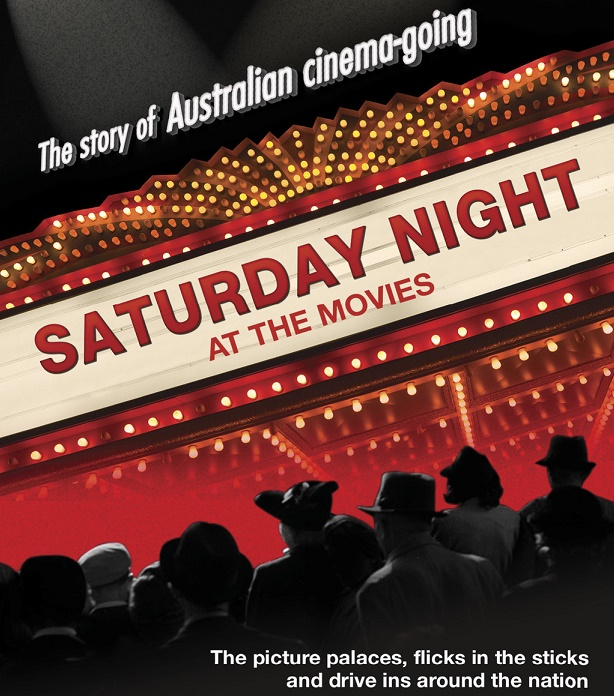 I just finished watching for a second time in four years a three part documentary that was made in 2015 by Foxtel, titled Saturday Night At The Movies, which covered cinemas in Australia from the beginning to the present time. There was some black and white film footage screened of patrons entering a cinema passing and looking at five one sheet size posters under glass hanging on the wall. The film titles in question were Jannie ( 1944 ), That's The Spirit, Strange Illusion, The Strange Affair Of Uncle Harry and The Daltons Ride Again ( all from 1945 ). What was interesting is the fact that the posters weren't fully produced official posters. 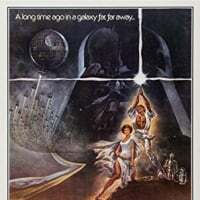 All the posters looked amateur with only the film's titles, along with two of the stars names appearing on basically plain backgrounds with only an added star on one and a few shooting lines on another. They appear to have been printed for the theatre screening them. 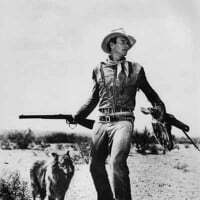 There is no proof this film footage was filmed in Australia and it could possibly be from from the U.S.A., as some other film material used in the program shown in the form of film posters was from there. I am not aware of this type of film poster being produced in Australia. My question directed to our American members is was this barebone poster style commonplace in the U.S.A., produced on the cheap outside the normal channels and displayed in some cinemas? 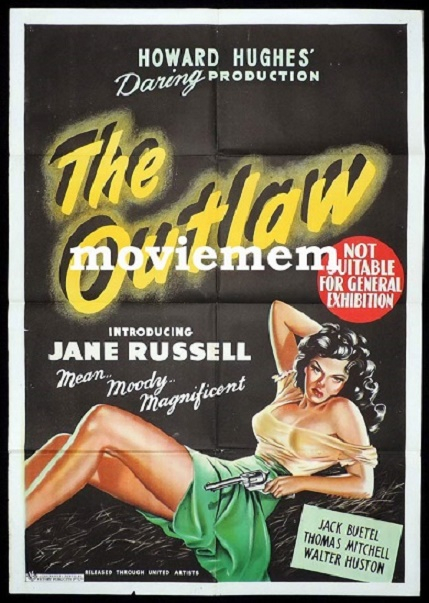 Don't Bother To Knock and The Outlaw Australian one sheets also featured in the Hayden Orpheum Picture Palace movie poster auction in 1995..
G.I. 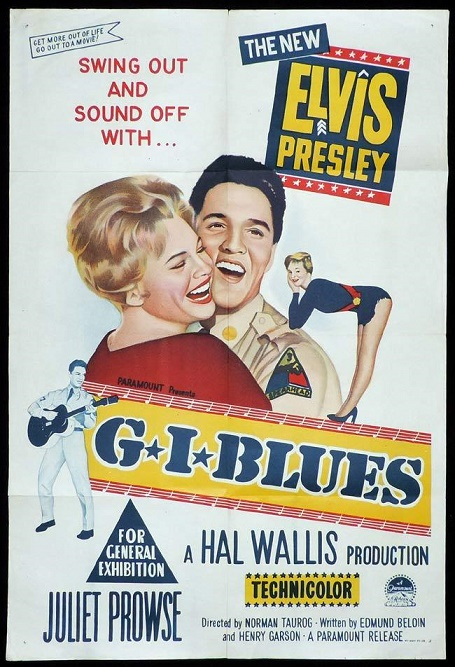 Blues Australian one sheet. Almost forgot this one. For the following Australian one sheet titles listed earlier on from the Hayden auction, I haven't been able to locate any images for any of these now or in the past.